I was excited to discover these versatile seating options that are designed for use indoors or also for outdoor living spaces, and a couple of them can even double up to be used as extra sleeping accommodations for out of town guests. About a year ago we moved from a house and downsized into living in a much smaller condominium. One of the things our move taught me is that it’s true what they say about “less is more”. It can actually be a very liberating feeling to learn to live more efficiently and to become more resourceful by choosing multiuse furnishings when your living space is somewhat limited. 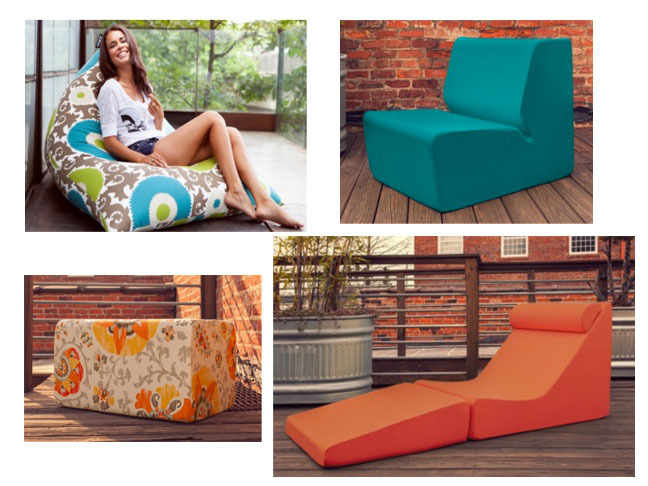 One of the first pieces in this product line to catch my eye is their Twist Bean Bag Chair. What I love most about it is that it’s not just an ordinary bean bag chair, but they’ve added a couple updated twists that make it even better than the original version. Plus, it’s designed with a fun body hugging new shape and materials that make it so you can use it both indoors and outdoors. It’s the perfect spot to plop down for a conversation with friends, to play video games or to doze off for an afternoon snooze on the patio deck. 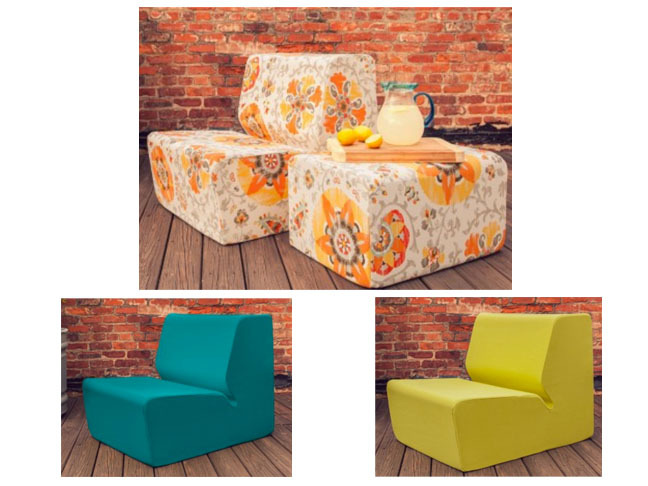 Convertible seating pieces are always great to have on hand when friends or family drop by or for those times when you need extra seating for casual dining or summer noshing on the patio. These colorful Inman Chairs are just perfect for those occasions since they can be used indoors or outdoors and they can be paired up perfectly with these Candler Ottomans ( shown next ). 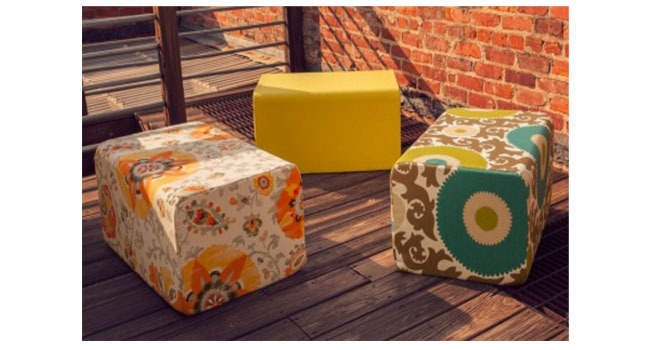 The vibrant colors and patterns available on these Candler Ottomans are just perfect to put your feet up on or they can be neatly stacked up against the wall until the time comes when you need some extra seating. 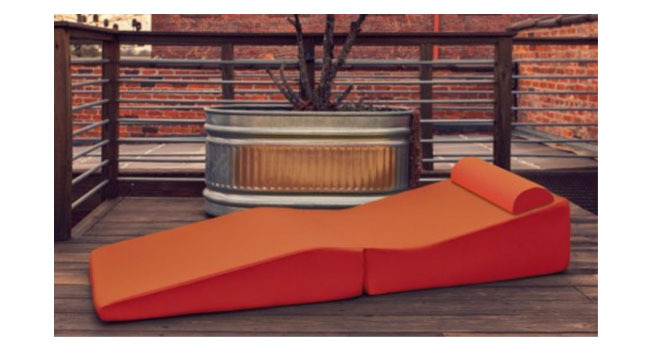 And these Clermont Outdoor Lounges work great for sunning on the deck outdoors, plus they can also double up in a pinch to pull indoors and use for extra sleeping accommodations for out of town overnight guests.